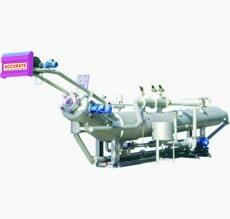 Loading capacity 300Kgs./(Single Tube Double Nozzle). Pressure vessel and all wet part of machine made of stainless steel AISI 316/316 L, highly corrosive resistance. The fully folded nozzle and nozzle diameter up to 83 to 110 mm. for manmade fabric. Newly developed high flow nozzle for light % heavy fabric. Liquor Ratio 1 : 5 to 1 : 6. Dye - 30 to 450 grams / Mtr. Sq. Fabric (polyester, polyester blend, woven & knitted fabric). All safety device required for a pressure vessel are incorporated with machine. Magnetic water level indicator with duly calibrated in terms of liter. Note: Especially those material sensitive to create mark such as polyester and micro fibre etc.